Last Year… Was I Scared! – My Boss Almost Fired Me! You’re going to love this. I was working for one of the big three automotive companies. You know the company President Obama bailed out… the one known as Government Motors. I remember the day quite well. My bossed called me and wanted to meet in a conference room. I knew then this was not good. When I walked in the room I was surprise to see a representative from Human Resources sitting across from my boss. As I sat down next to my boss, my stomach started forming knots. I was wondering if I was about to be fired. I remember hearing stories about people getting fired this way before. They received an unexpected phone call to meet their boss in the conference room. I hope this is not that moment. The last time I received an unexpected phone call from a boss, I was told I would be moving to another department with more responsibility. Maybe this was the situation. My boss spoke, and introduced me to the Human Resource person. To hide their identity I am going to call the person H.R. “I’m sorry, you didn’t get the email?” replied my boss. “No I did not.” I said. “So you want me to work the standard 40 hours plus 10 hours unpaid overtime?” I said. “That is correct.” Said H.R. “Well, I will not be able to do that. 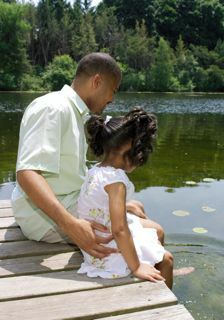 I am a single father raising my daughter. I do not feel comfortable leaving my daughter in daycare for 12 hours. The state of Michigan frowns if a child is in daycare for more than 10 hrs. Being that the daycare facility is 45 minutes away from work, I can only work eight hours.” I said. “Can someone else watch her?” replied H.R. “No, my family lives out of state.” I replied. “Well you are a great worker Claude. Everyone in the organization agrees. So we are willing to help you out. You can elect to go part-time. You can work a maximum of 36 hours a week or a minimum of 20 hours. What do you say?” said H.R. “What’s the alternative?” I said. “Ok, great we will work out the details on Monday. I send you an email shortly. Look it over and we can finalize it on Monday. “ said H.R. The next day, I found out another guy in my department was fired. Looks like I was lucky. I still remember the devastating look on my girlfriends face when I told her that evening during our date. I figured I better tell her to see if she is after my money. Just kidding. I was searching for an honest relationship, so in order to receive honesty you must give honesty. It gets worse... This engineering job was my only income. I was using my credit cards because each month I was about $200 short. On top of that due to my past divorce, I was still paying interest on previous credit card charges. I was thinking about filing for bankruptcy. But I didn’t because the righteous action is to pay all debts. How will I pay my debts with a pay cut. I’ll be going from $79K to approx. $50k a year. The salary I made when I first started. How will I make up the difference? I always wanted to start my own business, but I was not sure how and in what industry. I just need extra money, about $1000 a month. How can I do it, with out asking my parents for money, or deceiving people on the Internet? What is the secret of the Wealthy? I continued to ask myself. I began to seek wisdom and pray for direction. I joined a couple of network marketing opportunities. Big mistake! Found them emptying my pockets quicker than I could make a sale. So I continued to search on the Internet. I had to find something that I could buy, learn the marketing side of the business and not have to pay a fee each month. So I called a local guy that is successful in network marketing. He is making a lot of money, a high five-figure income from network marketing and direct sales. I asked if I could treat him to lunch and ask a few questions. He replied of course, especially since I bought a program from him in the past. Lunch went down like this. 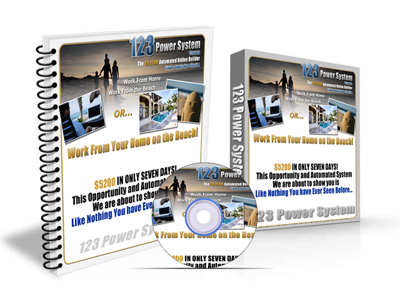 I expressed my financial situation in general and he mentioned a book called the 123 Power System. It’s a book that explains how to market affiliate and network marketing products in a simple step-by-step format. In addition, when you purchase the book you have the rights to sell it to others as a distributor. “Wow that sounds right up my ally. “ I said. I went home right away and researched. The book is legit. I purchased the book and software. A couple weeks later I made my first sell. I could hardly believe it; I made my money back in the first sale. And then I sold another… another and more. Not only that, I now use the methods to sell other products and services that put money in my pocket. Six biggest warning signs in selling affiliate products… In health, weight, beauty and moneymaking products. A simple 15-minute trip to the local library can save you hundreds of dollar on mailing lists. Why traditional classified ads are a waist of money… but become a gold mine with this simple new trick! 7 secret tips to write a fool-proof sales page that will even get the attention of a blind man.